What if the answer keys to our educational exams were questions? With a few blank spaces for even better questions? What if, instead of “answers”, google searches turned up hits of even more questions? Why are you asking why the sky is blue? Why is it called the sky? Why does the word blue have several different meanings? What if we had Q&Q periods instead of Q&A? 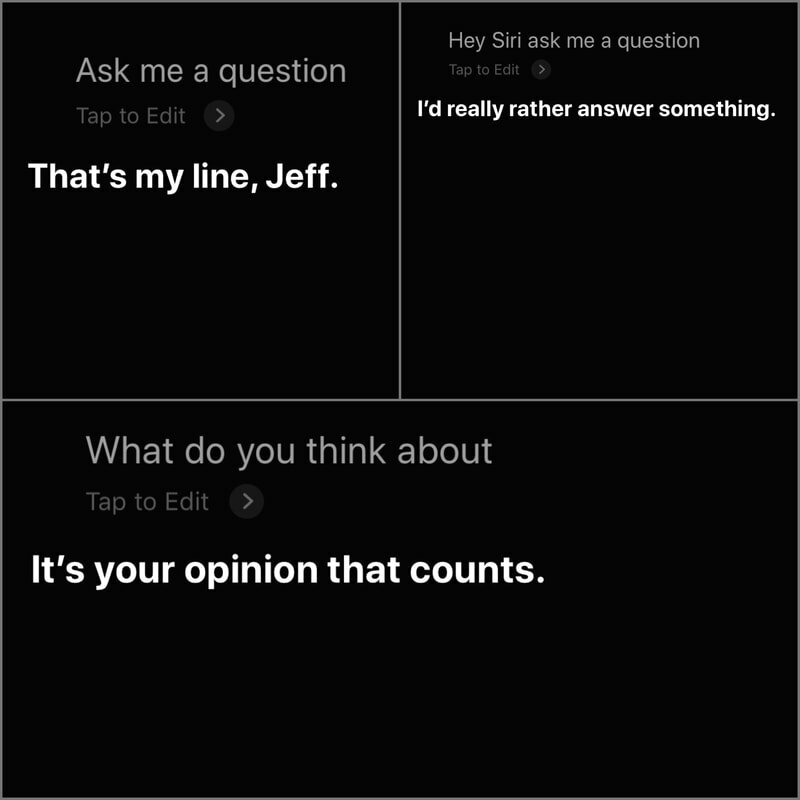 What if Siri actually started asking us questions instead of the opposite? I asked Siri a few questions. Wasn't happy with her responses - or lack of questions. Curiosity is the foreplay of discovery. Discoveries are not the fruit of outstanding talent, but rather of common sense enhanced and strengthened by technical education and a habit of thinking about scientific problems. You can tell whether a man is clever by his answers. However, you can tall whether a man is wise by his questions. On average, we ask 40,000 questions between the ages 2 and 5 and steadily decline in our question-asking thereafter. The important thing is not to stop questioning. Curiosity has its own reason for existing. One cannot help but be in awe when he contemplates the mysteries of eternity, of life, of the marvellous structure of reality. It is enough if one tries merely to comprehend a little of this mystery every day. Never lose a holy curiosity. What if we returned to asking more questions? "But if it’s uncertain that our ideals are attainable, why do we bother reaching in the first place? Because if you don’t reach for them, it is certain you will never feel that your life has meaning. ​And perhaps because, as unfamiliar and strange as it sounds, in the deepest part of our psyche, we all want to be judged." So true is this, that Lessing, who was among the wisest of thinkers, said, that if he had to choose between the attainment of truth and the search for truth, he would prefer the latter. The true gain is always in the struggle, not the prize." Funny thought came to mind. In general, it is human nature to hold likes with high currency. This is hard to deny given the state of society we live in. However, when giving them out ourselves, they seem to hold low currency and value. We are very liberal and generous. What message are we sending? Maybe we should hold them a little closer? ​"Man will only become better when you can make him see what he is like." In many professions, strict - or should I say thick - boundaries are strongly recommended if not required. Doctor - Patient, Teacher - Student, Employer - Employee to name a few. These are important, without question, though often with transactional relationships as a side effect. Joe Ehrmann in "Inside Out Coaching" speaks of the importance of transformational over transactional relationships, yet discourses lacking emotion promote the latter rather than the former. Here's a piece from David Brooks on putting relationship quality at the center of education. These two are my most recent reads. Here are some of the most vivid excerpts that stood out to me. ​It is ironic that the word narcissism has come to mean self-love, when it is in fact the case that the worst narcissists have no cohesive self to love, which is the source of their problem. Whenever you feel unusually certain and excited about a plan or idea, you must step back and gauge whether it is a viral group effect operating on you. Never relinquish your ability to doubt, reflect, and consider other options - your rationality as an individual is your only protection against the madness that can overcome a group. ​Tribalism has its roots in the deepest and most primitive parts of our nature, but it is now coupled with much greater technological prowess, which makes it all the more dangerous. Try to pay less attention to the applause as it grows louder. The problem we face as social animals is not that we experience this (social) force, which occurs automatically, but that we are in denial of its existence. We become influenced by others without realizing it. Accustomed to unconsciously following what others say and do, we lose the ability to think for ourselves. When faced with critical decisions in life, we simply imitate what others have done or listen to people who parrot conventional wisdom. ​What drives much of our behaviour is to have control over circumstances. Fifty years ago, many arguments were rooted in psychoanalysis and sociology. Now, arguments revolve around genetics and the human brain…Sentences are shorter, designed to communicate information. When things break down, what has been ignored rushes in. ​An idea is more credible when it emerges as a consequence of investigations in different realms. Order is not enough. You can’t just be stable, and secure, and unchanging, because there are still vital and important new things to be learned. Nonetheless, chaos can be too much. You can’t long tolerate being swamped and overwhelmed beyond your capacity to cope while you are learning what you still need to know. Thus, you need to place one foot in what you have mastered and understood and the other in what you are currently exploring and mastering. ​You might consider judging your success across all the games you play. Imagine that you are very good at some, middling at others, and terrible at the remainder. Perhaps that’s how it should be. You might object; I should be winning at everything! But winning at everything might only mean that you’re not doing anything new or difficult. You might be winning but you’re not growing , and growing might be the most important form of winning. Should victory in the present always take precedence over trajectory across time? Violence, after all is no mystery. It’s peace that’s the mystery. Violence is the default. It’s easy. It’s peace that is difficult: learned, inculcated, earned. ​To have meaning in your life is better than to have what you want, because you may neither know what you want, nor what you truly need. Meaning is something that comes upon you, of its own accord. Meaning signifies that you are in the right place, at the right time, properly balanced between order and chaos, where everything lines up as best it can at that moment. People can be so confused that their psyches will be ordered and their lives improved by the adoption of any reasonable orderly system or interpretation. ​Absolute equality would therefore require the sacrifice of value itself - and then there would be nothing worth living for. What can be truly loved about a person is inseparable from their limitations. But if it is not thinking that can be relied upon in the direst of situations, what is left? Thought, after all, is the highest of human achievements, is it not? Perhaps not. Something supersedes thinking, despite its truly awesome power. When existence reveals itself as existentially intolerable, thinking collapses in on itself. In such situations - in the depths - it’s noticing, not thinking, that does the trick. You must decide whether you want to be right or you want to have peace. You don’t get peace by being right. You just get to be right. Aim for Paradise, concentrate on today. Orient yourself properly. Then - and only then - concentrate on the day. Set your sights at the Good, the Beautiful, and the True, and then focus pointedly and carefully on the concerns of each moment. Aim continually at Heaven while you work diligently on Earth. Attend fully to the future, in that manner, while attending fully to the present. Then you have the best chance of perfecting both. Some people choose to receive The Present when they are young. Others when they are in middle age. Some when they are very old. And, some people never do. Preparation - The work that you put in. Your research, your reading, your writing, your thinking. Not unlike the overcoming of inertia. Attacking the problem from all angles. Incubation - The simmer. The stage of "unconscious processing." This can take two forms; active and passive. The first, active, is where other unrelated conscious tasks are performed. Working on one's car, arranging a jig-saw puzzle, tackling another project. The second, passive, is where one simply is taking a break. Going for a hike, walking the dog, swimming laps, etc. Illumination - The a-ha moment when the answer bursts into one's consciousness. In the shower. Mid-Sunday morning run. Often when we're least expecting it and with minimal, if any, exertion. Verification - A return to the conscious. The integration of the eureka back into your research, your reading, your writing, your thinking. "Why don't we learn this in school?" In an age of information and opinion overload, learning foundational tenets is paramount. So is learning how to think critically. Harari states, "In a world deluged by irrelevant information, clarity is power." Our schooling is a stepping stone. To learn the necessities and to develop critical thinking skills. To learn what is relevant and to learn how to develop a filter. A filter that is important now, more than ever. From Stu's twitter feed. Includes some discussion on whether or not Compassion should be included either in place of, in addition to, or integrated with Empathy. My personal opinion is that compassion (I care) can make empathy (I understand) so much more powerful. “One of the most philosophical remarks I ever heard made was by an unlettered workman who was doing some repairs at my house many years ago. ‘There is very little difference between one man and another,’ he said, ‘when you go to the bottom of it. But what little there is, is very important.’"
Appropriately, I'm reminded of the old adage, "Stop managing your time. Start managing your focus." "Some of us are really tired (for I do not mean absolutely to deny that our climate has a tiring quality); but far more of us are not tired at all, or would not be tired at all unless we had got into a wretched trick of feeling tired, by following the prevalent habits of vocalization and expression. And if talking high and tired, and living excitedly and hurriedly, would only enable us to do more by the way, even while breaking us down in the end, it would be different. There would be some compensation, some excuse, for going on so. But the exact reverse is the case. It is your relaxed and easy worker, who is in no hurry, and quite thoughtless most of the while of consequences, who is your efficient worker; and tension and anxiety, and present and future, all mixed up together in our mind at once, are the surest drags upon steady progress and hindrances to our success." When we define ourselves by our work, by our dedication and effectiveness and willingness to go the extra mile, then it's easy to see rest as the negation of all those things. If your work is your self, when you cease to work, you cease to exist. Indeed, virtually every ancient society, recognized that both work and rest were necessary for a good life: one provided the means to live, the other gave meaning to life. When we stop and rest properly, we're not paying a tax on creativity. We're investing in it. The brain's creative work is never done, that even in its resting state the brain is plugging away at problems, examining and tossing out possible answers, looking for novelty. This is a process we can't really control. But by learning to rest better, we can support it, let it work, and take notice when it's found something that deserves our attention. Knowledge requires the marriage of logical and discursive methods (ratio) and contemplative practices and attitudes (intellectus). Intellectus, in turn, was enabled by leisure - not just spare time but an attitude of non-activity, of "inward calm." When we treat workaholics as heroes, we express a belief that labor rather than contemplation is the wellspring of great ideas and that the success of individuals and companies is a measure of their long hours. It is not constant effort that delivers results but a kind of constant, patient, unhurried focus that organizes the investigator's attention when at work and is present but watchful during periods of ease. A day that starts with work creates rest that can be enjoyed without guilt. Some considerations when in a teaching, guiding, mentoring, and/or motivational role. Curiosity is the feeling of deprivation we experience when we identify and focus on a gap in our knowledge. The student needs to feel this gap. They must have some level of knowledge or awareness before they can get curious. In a way, they need to be beyond the “don’t know what they don’t know stage”. Therefore, often “to induce curiosity about a particular topic, it may be necessary to ‘prime the pump’”. To use intriguing - stimulating - teaser information to get them interested in order to actually become curious. “Trust is the stacking of small moments over time, something that cannot be summoned with a command - there are either marbles in the jar or there are not. This is an imperative consideration should a disconnect between two individuals be sensed. Even better, this should be considered proactively. Consistency in actions, always play the long game. Continuing from above, this excerpt is from Brett Bartholomew's Conscious Coaching Field Guide. "Quit trying to tell people everything you know. A more effective approach is to ask them about what they know. Learning about their world will help you modify your approach and provide more opportunities for you to reframe and relate a concept to help them better understand." "That's because they were able to connect experiences they've had and synthesize new things. And the reason they were able to do that was that they've had more experiences or they have thought more about their experiences than other people." A quick note on this, not unlike everything else. I recently failed an online exam. The one time exam required an 80% in order to pass and this was made clear prior to taking. Although I was aware of this, it was my choice to go ahead and take the exam - unprepared - during a short block of time in between patients. The exam took me 26 minutes to complete, of which a maximum time of 80 minutes was allotted. Although devastated, I was glad this happened. Really, my heart sank. But guilty as charged. As the saying goes, "Success is the worst teacher." Should I have passed the exam, I would have received my certificate and CE credits. But most importantly, I would have failed to obtain a deep understanding of the material. As I tweeted recently, "If you're going too fast, life will somehow find a way to give you a speeding ticket. Heed its warning before you get into an "accident." This was my speeding ticket. Back in the blogging days it wasn’t uncommon to be called out on one's content in the comments section. This peer review or critical appraisal in my opinion was conducive to getting better. Other than twitter, I’m not sure this happens much anymore. Especially on instagram. Today, it's far too easy to block those who disagree with one's opinion and as a result little accountability exists. It's okay to not "like" a post. Again, "Success is the worst teacher." Joy of Missing Out - I love this. My scape goat, my excuse, my vice. Although I'll will be giving myself an indefinite hiatus as of the new year. TSUNDOKU - Derived from "doku" (reading) and "tsun" from "tsumu" (to pile up). As stated on BBC, buying reading material and piling it up. Or as elaborated upon in the New York Times, "the sight of a book you haven't read (to) remind you that there are many things you've yet to learn." Leaders must either invest a reasonable amount of time attending to fears and feelings, or squander an unreasonable amount of time trying to manage ineffective and unproductive behaviour. Empathy is infinite and renewable... the more you give, the more we all have. In conversation, a well-placed cuss word or three seems really good, but in writing, it seems more intentional and less organic. If I miss the boat, it wasn't my boat. To opt out of conversations about privilege and oppression because they make you comfortable is the epitome of privilege. If we don't have the skills to get back up, we may not risk falling. Stay curious, learn to resist needing to know. Let’s suppose we take this glass and drink it at 5pm. Fantastic. We then refill it and consume another glass at 5:30pm. Great. At 6pm we have another. And at 6:30pm another. Finally, at 7pm, within approximately two hours, we have our 5th glass. In general, how will most of us feel? Now let’s say we’re rehabbing from an injury or perhaps trying a new training program - marathon running, crossfit, yoga, whatever - for the first time ever. We have our first high intense session on Monday. We’re feeling great. We have a second session on Tuesday. Smooth. The same on Wednesday...if you recall, we’re either recovering/rehabbing from an injury or starting a novel training program. And again we train on Thursday. Not feeling so hot after all. Back to the wine. Let’s say we have our first glass at 5pm. The second glass we drink at 6:30pm. We enjoy those glasses, take a bit of a break, and have another at 9pm. Knowing that we’re not driving for the evening, we have a small glass at 11 or even call it quits at three glasses. In general, how will most of us feel? Often we are quick to point blame to specific muscles and joints when in fact a simple “too much too soon” is at play. Cumulative load within a short time period will often set us up for failure. Keep it simple. Exercises arenât special. But what you do with them may be. Whether you call it the Bunkie MSL or the Copenhagen Adduction exercise, progression and regression of the moment arm combined with duration modifications are what makes intended loads appropriate. To load âstrengthâ start proximal and progress distal with decreasing rep duration. To load âenduranceâ start distal and progress proximal with no change in rep duration. Simple, not fancy. âJust wanted to expand on this a little. First, this exercise is not new. Recently it's been called the Copenhagen Adduction exercise while ten years ago it was called the Bunkie exercise for the Medial Stabilizing Line. Prior to that, I'm sure it's had its fair share of names as well. Many currently use it for adductor strengthening while others use it to isometrically load the MCL during early stages of rehab. Some use this exercise for torso control and others may even use it for the shoulder. In my opinion, it may be one of many valuable rudimentary exercises to include in a GPP circuit. What's most important though, is to use it appropriately. While the goal would be to use the longest possible moment arm for the longest reasonably possible duration, many in early stages of rehab are unable to do so. There simply is no way to hide it. So for very early stages of adductor or MCL strength loading, it's best to keep the moment arm as short as necessary and choose the appropriate starting point for duration. If starting with a ten second hold, each subsequent repetition would be one second less in duration. A countdown. 10, 9, 8, 7, 6....and so on. As one progresses, each subsequent repetition can then be performed with a slightly longer moment arm, where the line of force moves distally. Again, 10, 9, 8, 7, 6...and so on. From here we have several options. Once the individual is able to load for strength distally, it would be appropriate to load for endurance. Therefore, starting distally, if the athlete is able to load for five seconds (for example), then they may be able to perform 5 x 5 sec holds while shortening the moment arm with each subsequent repetition. From here, it is possible to progress with a longer duration first repetition (i.e. 6, 5, 5, 5, 5) as well as a minimizing the amount of moment arm shortening so that the line of force stays as distal as appropriately possible. The possibilities are endless. This is not to make things more complex, it is to make the exercise more appropriate. It's simple progressions and regressions with the goal of progressive adaptation. If the goal is to develop the shoulder and arm's contribution to pulling, doing so with the scapula relatively fixed appears to generate the most force production and minimal GH joint wear. In this video, I performed Prone Kettlebell Rows (isometric holds) and progressed in bell size until form significantly diminished. A focus on "pinching the shoulder blades" - or retracting the scapula - would have disallowed the load I was able to achieve. This would be very clear to those who perform loaded rowing movements on a regular basis. As mentioned above, a fixed scapula appears to generate the most force production. Whether dragging sleds, playing tug of war, or helping someone from falling off a cliff, most likely do not focus on pinching the shoulder blades. Particularly with heavy loads, the shoulder girdle generally assumes a centrated position and holds itself there with an isometric contraction enabling the remaining segments of the upper extremity to function in phasic contraction. Including the lower extremities (thinking dragging sleds). This is why yielding isometric holds are being utilized above. This message should not be confused with never retract or even never retract with pulling. This brings us to Bat Wings. Dan John states that the aim with his exercise should be indeed to squeeze the shoulder blades together. Often as hard as possible. Those who are familiar will admit the ease of which loads heavier than the exercise intends may be used. Thus, my preference is the use of the FRC principle of End Range Lift-offs ​and perform Bat Wings in such position. The aim here is short-range neurological control and force production. Or, increasing the surface area under the left side of the arc of the length-tension relationship curve. A reminder that requisite mobility precedes. Meaning, adequacy with no external load prior to the use of external load. Elevating the kettlebell/dumbbell - a minimum of 7 inches off the floor facilitates proper Lift-off starting position, but more importantly, prevents the use of heavier loads than would be effective. Bracing and maximal irradiation are a necessity here. At the end of the day, however, the system - a set of things interconnected - will "produce its own pattern of behaviour over time." (​See @drmchivers for more information on Systems Thinking.) And the above, are ways of training its component parts.